So Bryan Jones at elearningart.com did a very fun interview with me for his blog. 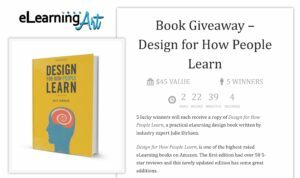 In conjunction with the interview, he’s giving away five copies of Design For How People Learn! Elearningart.com is a nifty resource for creating scenario based learning, and much easier than combing the stock photo sites for multiple pictures of the same model. There’s an interview with me on elearningmagazine.co where I talk about things like the importance of using conversational language. I’m also teaching a few public workshops in the next few months. I’m teaching at session of the Advanced Instructional Design for Elearning Certificate at the ATD ICE Conference on May 20-21 in Denver. I’m also doing an elearning instructional design certificate program at the Online Learning Conference in Chicago September 19-20. This entry was posted in Uncategorized by jdirksen. Bookmark the permalink.